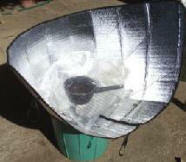 Solar food cookers use an arrangement of reflectors to concentrate solar energy on a cooking vessel. A number of innovative designs have been developed. Many of the solar cooker designs are inexpensive and easy to build. 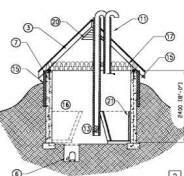 This page also covers solar food dryers, solar stills to purify water, and root cellars for storing food. 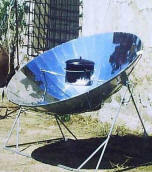 Lots of info on solar cookers, solar cooking and solar food dryers. Plans for solar cookers and food dryers. This site provides information on many solar cooker designs spanning a large range of design types, sizes, and capability. You can even add your own comments on cookers. www.home.ix.netcom.com/~jdhowell/ Nice book on solar cooking -- title pretty well describes it -- has plans and recipes. Useful information and pictures on the website. 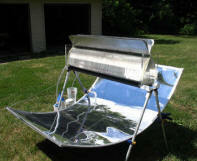 A very nice site describing the Parvati solar cooker. Provides good assembly diagrams and pictures. The cooker is pictured at the top of this page on the left. This is a compact, foldup, easy to carry and setup solar cooker that you can either buy or make. 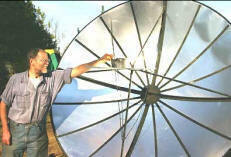 Bill's excellent solar cooking page. 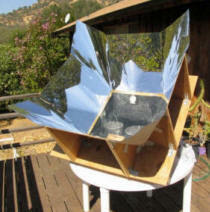 Great solar cooking plans, tips, and recipes. Another good solar cooking site with some plans and hints and lots of recipes. 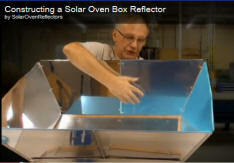 This company provides how to build information a simple solar box oven. 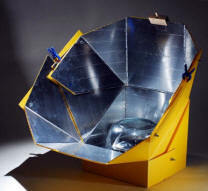 This is a nice design solar cooker from Jim La Joie. The unique feature of the cooker is that the cooking vessels is always positioned on the flat bottom of the cooker, and the reflective panels are easily repositioned with one motion to focus the sun on the cooking vessel. Jim provides a very nice set of free plans for the cooker. 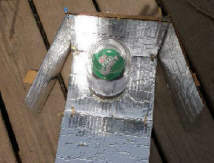 A Backwoods home article on making and using a simple solar cooker made mostly from a cardboard box. Very detailed plans, design, and test data for a solar cooker that tracks the sun. Details on the Solar Jar Cooker... This is a neat little very portable solar cooker that Tony developed and sent in. Perfect for heating soup, a beverage, or a hot dog! Full construction details... This is a very interesting project from Mik that gives the details on building a solar cooker that stores solar energy in a bundle of steel rods during the daytime, and then uses the stored heat for cooking after sunset. Mik is looking for ideas on improving the prototype. An impressively large concentrating community Solar Cooker. These Scheffler heliostats concentrate the sun onto a fixed cooking vessel, or onto a heat storage device that provides for cooking after sunset. 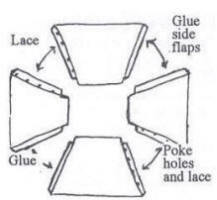 This type of concentrator can be built with common materials and ordinary skills. The daily tracking can be by a simple clockwork mechanism, and seasonal tracking can be manual. Solar Fire provides detailed plans and how-to instructions for building three different sizes of concentrating solar collectors. The materials are easily obtainable and the design is simple and straight forward -- the concentrators can be made with readily available materials and simple tools. The Helios collector provides about 3 KW output and temperatures up to 950C. Several potential applications are discussed. 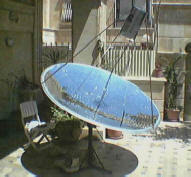 Using an old satellite dish as a solar cooker. 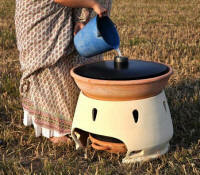 An interesting site with some interesting solar stove designs. 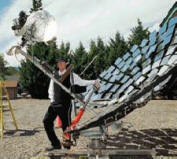 Good paper on parabolic solar cookers with quite a bit of design information. A large solar oven - "Each VILLAGER SUN OVEN® when utilized as a Sun Bakery can save over 150 tons of wood annually which results in the reduction of 277 tons of CO2 green house gas emissions annually." 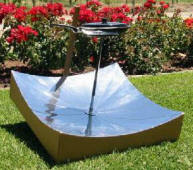 This article provides very complete instructions on how to make and use the solar funnel cooker. It also describes how to use it to cool or refrigerate materials via radiation to the sky at night. Very detailed article on designing, constructing, and the pros and cons of a solar oven mounted to an exterior wall with access from the inside. Good review of various types of solar cookers, cooking techniques, and solar cooking recopies (including a Chocolate-Mint Ricotta Mousse!). How to build a 1200F solar coffee bean roaster. Home P ower Magazine article, issue 43. Report on the Home Power Solar Cooker Contest. Interesting solar cooker designs, and full plans for the winning cooker. 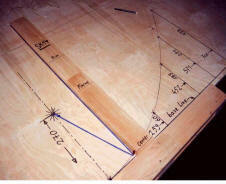 An easy to make tool for drawing parabolas as used in concentrating collectors. 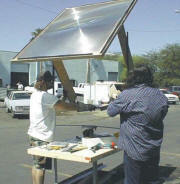 Solar cooking on a large scale. 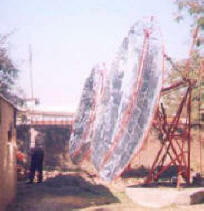 84 parabolic concentrators of 9.2 sq meters each. Capable of cooking 20 to 40 thousand meals a day! 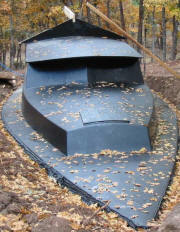 This type of concentrator can be built with common materials and ordinary skills. 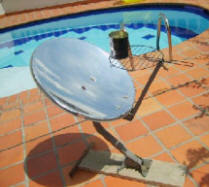 Details on Juan's solar cooker design ... (pdf) This is a cooker design in work from Juan. While its probably not the design you want to build if you just want try solar cooking, it does have a number of unique and interesting ideas. 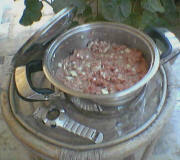 If you are a solar cooking experimenter, you will probably find it very interesting -- I did. An innovative design commercial product to heat water. Very good article on solar food drying. Plans for food dryer. Quite a bit of data on how to optimize the drying process. A very well thought out and researched solar food dryer from Dennis Scanlin at Appalachian State University. The dryer is the end result of a long research and testing program. Complete plans are provided for building it. More information on this design and how it was developed in the entries just below. 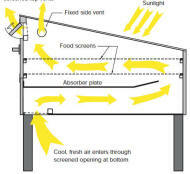 Very good article from Appalachian State University on finding an optimal design for a solar food dryer. Various absorbers, reflectors, glazing arrangements etc. were tested to find what works best. A highly refined design, plans and operating data for a solar food dryer by Appalachian State University. Try the first link first, if not there, search the archieves. What appears to be a very efficient and simple design for a solar food dryer. Lots of other interesting sustainable living projects on this website. Paul's Permaculture site... 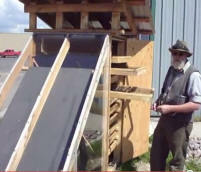 This is a video by Paul Wheaton showing three large solar food dehydrators. They all look pretty easy and cheap to make and they all appear to work. 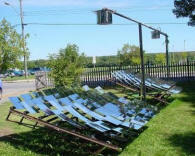 Lots of solar dryer design information on solar food dryers. This is from the I Tech site, which offers several other public domain projects. Test of solar crop dryer. Extensive data collected on optimizing drying process. 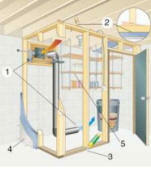 Details on how dryer is constructed. 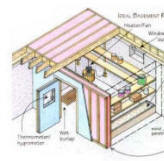 Article covers the basics of solar heated food dryers and what goes into a good design. Author operates www.SolarFoodDryer.com and also offers a kit for building a solar food dryer he designed. Quite a bit of information on solar food drying on this site. Simple solar food dryer plans.
" Made from two cardboard boxes, some clear plastic wrap, and a little tape. You can build a nearly free solar dehydrator. Set it on a stool or chair and face it's solar collector towards the sun, and you have a functional food preservation machine for little work and even less money." Very complete VITA paper describing a wide variety of solar stills for making potable water. A good deal of design and construction information. More details on how it works... This is a promising new design for a solar still that is said to produce 5 liters of clean water per day. A slick new design for solar still. "This Invention represents a conical, self-supporting and stackable Unit made from transparent, thermo-formable polycarbonate (same as water dispensers) outfitted with a screw cap spout at the tip and an inward circular collecting trough at the base. Technically speaking it is a solar still. " 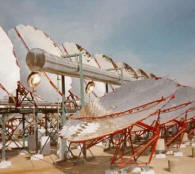 Main page on solar stills.. The El Paso Solar Energy Association has had a program that involves building and and collecting data on family operation of Solar Still for several years -- the links provide a lot of detail on the still and how well it has worked out. The plans link gives a fairly detailed picture of a still cut in half to show the components. Probably good enough to build one from. This is an interesting design for solar water distiller. The mirror is very simple, using aluminized mylar for the reflective surface and a simple and light aluminum frame that is pulled into position using tension wires..
Well, here is an approach to a root cellar you don't see every day. George found an large fiberglass boat hull for not a lot of money and buried it for a very nice root cellar (not to mention bunkhouse). This may seem a bit silly at first, but George points out that there are a lot of boats out there that will never see water again and are just wasting away -- I'm sure they would love to have a new life as a root cellar. Root cellar for vegetable storage. Lots of information on how to get along without a fridge, including a root cellar in basement, conventional root cellars, and spring water refrigeration. 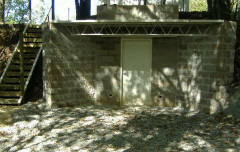 Good article on building a root cellar or cooler in the basement that will keep vegetables fresh through the winter. Good use of insulation and outside venting make this look like a good design to me. www.backwoodshome.com/forum/vb/showthread.php?t=19039 This looks like a nice DIY design for a root cellar that can also serve as a storm shelter. This frig uses a well insulated 300 gallon water/ice container that is cooled by an outdoor finned tube baseboard unit to supply year round refrigeration with no energy use. No moving parts. Other interesting projects on the same site.